Two galaxies perform an intricate dance in this new Hubble Space Telescope image. The galaxies, containing a vast number of stars, swing past each other in a graceful performance choreographed by gravity. The pair, known collectively as Arp 87, is one of hundreds of interacting and merging galaxies known in our nearby universe. Arp 87 was originally cataloged by astronomer Halton Arp in the mid 1960s. Arp's Atlas of Peculiar Galaxies is a compilation of astronomical photographs using the Palomar 200-inch Hale and the 48-inch Samuel Oschin telescopes. The resolution in the Hubble image shows exquisite detail and fine structure that was not observable when Arp 87 was first cataloged in the 1960s. 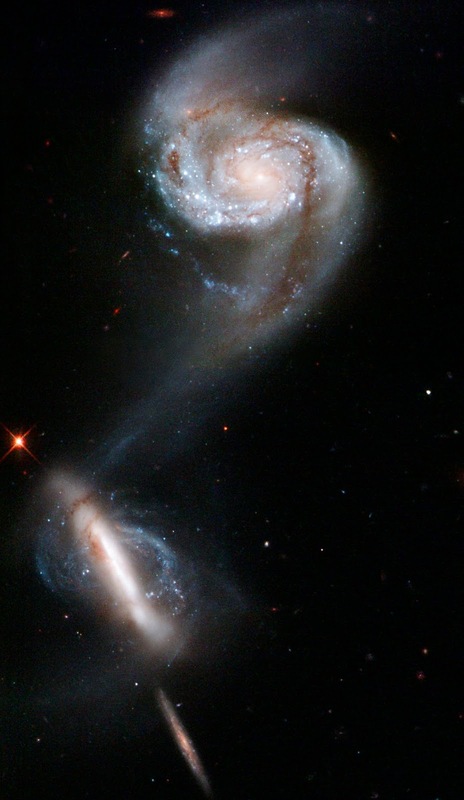 The two main players comprising Arp 87 are NGC 3808 on the right (the larger of the two galaxies) and its companion NGC 3808A on the left. NGC 3808 is a nearly face-on spiral galaxy with a bright ring of star formation and several prominent dust arms. Stars, gas, and dust flow from NGC 3808, forming an enveloping arm around its companion. NGC 3808A is a spiral galaxy seen edge-on and is surrounded by a rotating ring that contains stars and interstellar gas clouds. The ring is situated perpendicular to the plane of the host galaxy disk and is called a "polar ring." As seen in other mergers similar to Arp 87, the corkscrew shape of the tidal material or bridge of shared matter between the two galaxies suggests that some stars and gas drawn from the larger galaxy have been caught in the gravitational pull of the smaller one. The shapes of both galaxies have been distorted by their gravitational interaction with one another. Interacting galaxies often exhibit high rates of star formation. 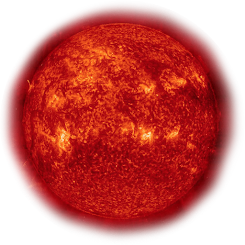 Many lines of evidence - colors of their starlight, intensity of emission lines from interstellar gas, far-infrared output from heated interstellar dust - support this fact. Some merging galaxies have the highest levels of star formation we can find anywhere in the nearby universe. A major aspect of this excess star formation could be properly revealed only when Hubble turned its imaging capabilities toward colliding galaxies. Among the observatory's first discoveries was that galaxies with very active star formation contain large numbers of super star clusters - clusters more compact and richer in young stars than astronomers were accustomed to seeing in our galactic neighborhood.